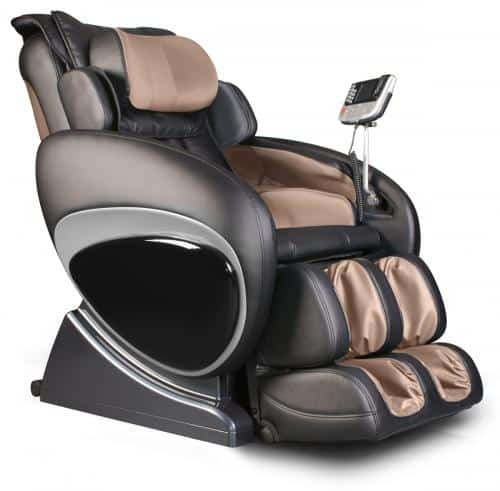 Take a look at the Osaki os-4000 massage chair. Have a bad back? Aching muscles? Just need to relax? Don’t want to pay a fortune for a massage chair? The Osaki os-4000 is one of the best and most affordable massage chairs in its price range on the market today. Its popularity over the last few years has grown due to its features and ease of use. If you want to jump ahead to check out a specific area of interest use the contents page below. 1.0.2 Where are Osaki massage chairs made? 1.0.10 There are also 5 different types of massage you may choose. 1.0.21 Size of the Osaki 0s-4000 – will it fit me? 1.0.22 How will the Osaki 0s-4000 fit your home? 1.0.24 How to assemble Osaki os-4000? 1.0.25 Who is Osaki os-4000 for? 1.0.26 Who is Osaki NOT for? 1.0.27 Can I use the Osaki os-4000 if I am pregnant? 1.0.28 Advantages of the Osaki os-4000 over Leading Competitors? 1.0.30 Conclusion: is the Osaki os-4000 worth your money? 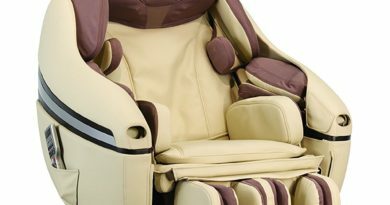 This article outlines the advantages to buying an Osaki os-4000 massage chair but also some of its drawbacks. We have studied all the available massage chairs and hope this article will help you to decide if this chair is right for you, your home and your family. There are also some links to find the best price right now if you want to buy a massage chair online. Take a look at our other massage chair reviews for comparison. We welcome feedback so if you want to get in touch please contact us and we will do our best to help. The Osaki punches above its weight on a number of points. It is not as expensive as other makes such as Panasonic or Sanyo but it is a quality product for the price. This chair has many advanced features that can be personalised for your own needs. It is also available to buy in a number of different colors to suit your home. It is easy to keep clean due to the faux leather polyurethane covering which is comfortable and durable. The Osaki company has spent a considerable amount of time and money researching how to make their chair appealing and adaptable to any type of home. As a result, the Osaki would not look out of place in any sophisticated modern home. The time for a standard massage is set to 15 minutes but you can extend this to 30 minutes if you wish. The versatility of this chair means you can fine-tune your experience to suit your needs. (It plugs into a USA standard 3-prong grounded 110/120-Volt, 50/60 Hz outlet and is UL listed). Where are Osaki massage chairs made? They are made in Texas in the USA by one of the leading distributors of electronic massage chairs. Osaki also makes other fitness and massage relief products, such as held massagers, foot massagers, fitness machines, and back relief products. • Rolling: the motion of the rollers mimic human touch massage or hands pressing and sliding up and down the spine. This technique is used at the beginning of a massage to warm the muscles and increase blood flow to the muscles. • Clapping: Professional masseuses use this technique by patting the muscles of the back with the palms of their hands. This helps to reduce muscular pain. • Kneading: the rollers make circular motions which help to reduce tension in muscles and reduce knots. • Tapping: this technique mimics fingers tapping along your spine which has been shown to reduce headaches and tension. Many users of this chair have said that one of their favourite features is the body scan. The sensors in the chair scan your whole body as you sit in it and adjust the chair automatically to personalize the massage for each person who sits in it. This technology means the rollers can change to match your body shape and can also change the height and width to accommodate most body shapes. This means the rollers don’t miss out any areas of your body, thus giving you a massage unlike many chairs in the same class. The Osaki has 5 different massage styles including, Vibration and airbag massage, Swedish, pulse mode and Shiatsu. There are also 5 different types of massage you may choose. Advantages for you to have a massage chair in your home are obvious. You may suffer from a bad back or take part in lots of sporting activities. Due to the versatility of this chair, you can choose a different type of massage depending on your needs. Or if you just want to relax after a hard day at work you can do that too. The 4000 model has 48 airbags that cushion the whole body which emulates a full body massage by a qualified masseuse. The positioning of the airbags means they are able to work on pressure points, which enhances the massage experience. The airbags are the secret. They give you that human touch to your massage as they envelop the body, hugging it for the greatest effect. 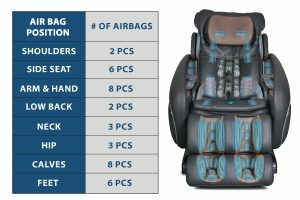 • There are 10 airbags on the chair just for your feet. • 3 more which hug your hips. 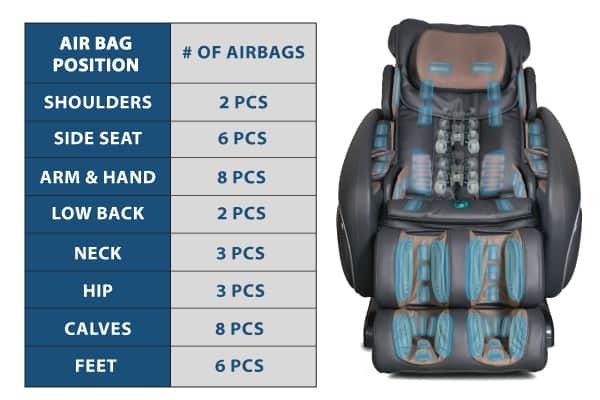 The combination of all the airbags gives you the feeling of a full body human touch massage in your own home. There are so many airbags they hug your body at every important point. There are also 5 pressure settings to help you create a personal experience. And you can intensify the effects of the massage to suit your own preference. The advanced roller mechanism on the Osaki mimics the human touch of a professional masseuse. They knead and grasp but can also focus on specific problem areas of your body. This means you can target areas of your body that need more attention. If you have back problems, the 30-inch roller covers the entire length of the back, from the base of your neck all the way down to the lumbar area. The rollers are made of soft material and feel like the feel of human thumbs. The Osaki has two modes to choose from, medium and narrow. This means you can adjust the rollers for the best massage for you. One major factor to consider when you are thinking of buying a massage chair is how well it works with the shape of the spine. 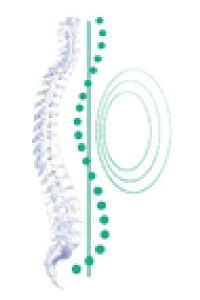 The Osaki os-4000 has an ergonomic design that has been developed to follow the natural S-curve of the spine. This feature also works with the body scan feature. Thus giving a specifically targeted massage to common problem areas such as the lumbar region, the neck and shoulders. This feature is a major advantage if you suffer from lower back pain. Heat in the lumbar region of the chair can ease tension and reduce inflammation. The combination of the massaging action of the airbags and rollers with heat will encourage blood flow to the painful affected back muscles. The heat can also enhance your feeling of well-being and relaxation. The Osaki os-4000 has a special vibration massage plate located on the back part of the upper legs. This is very relaxing and soothing. NASA developed zero gravity technology, and it has been utilised to good effect in this massage chair. This technology has also been adopted by many domestic and commercial products over the years. It allows the chair to recline to a degree where your heart is in line with your feet giving a feeling of zero gravity. This feeling of weightlessness has been researched to be the best posture for the greatest effects of a massage chair. Because of the position of the body during the massage in the chair, the pressure is displaced throughout the body. This benefits the whole body because it increases circulation and reduces strain on the spine. This obviously reduces back pain and relieves pressure and strain on the heart. This is believed to be the best position to induce relaxation and enable you to enjoy the benefits of the massage. 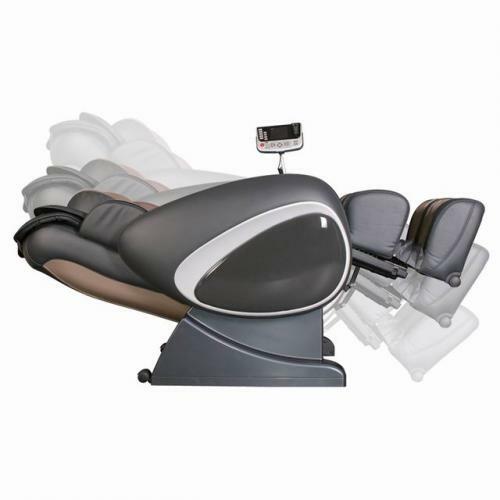 The Osaki 0s-4000 has 2 zero gravity settings and you can find the best position to recline for your needs. The Osaki 0s-4000 also has a leg rest. This has an inbuilt sensor that scans your legs and provides the most comfortable fit. If you are a tall person the leg area of the chair can extend to accommodate your personal dimensions. When you choose the foot and calves massage the sensor can target the acupressure points on the soles of your feet. This can help with many different health conditions. If you suffer from pain in your calves and feet the kneading action of the rollers can increase circulation and help reduce pain. The airbags enhance this process and give a more effective massage. When you sit in the chair the leg areas will extend then retract. Once it has retracted to the desired point you press your toes down firmly which tells the chair to stop. The viewing screen on this chair is one of the largest of any of this class of chair. This makes it easy to see what functions to choose and activate. The flip down cover gives access to the manual functions. You can tailor the functions for your own specific needs and select or isolate certain areas and types of massage. The control panel is easy to use but you also have a small wireless remote. 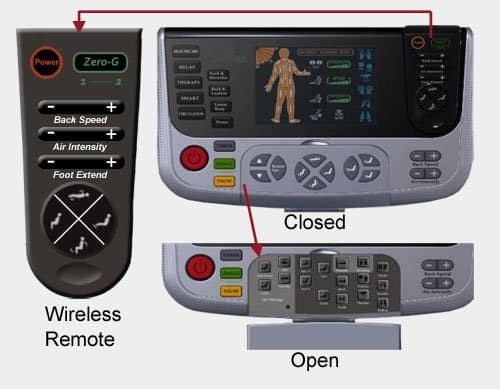 This enables you to control the chair and massage controls whilst in the reclined position. You can have peace of mind if you choose to buy the Osaki os-4000 due to the 3-year warranty. This is a major benefit. It demonstrates the confidence the manufacturer has in their product. The warranty also covers the chair in the home and in commercial areas. 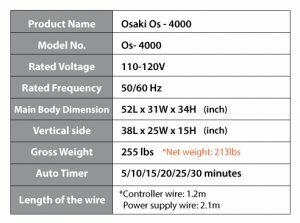 Size of the Osaki 0s-4000 – will it fit me? Outer shoulder measurements: 20 inches side to side. Which is approximately 46″ jacket size or 22″ shoulder width. If your shoulder width were larger than this you would be advised to try the Osaki 0s 3D Pro Cyber, which has an additional 1.5″ more. The width of the seat base is 17″ which is about a 40″ waist measurement. 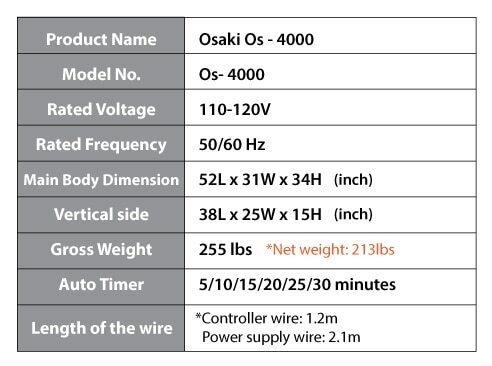 How will the Osaki 0s-4000 fit your home? The total space needed to allow the massage chair to function normally front to back when in the reclined position is – 6ft. Width: 3ft from side to side. How to assemble Osaki os-4000? Who is Osaki os-4000 for? 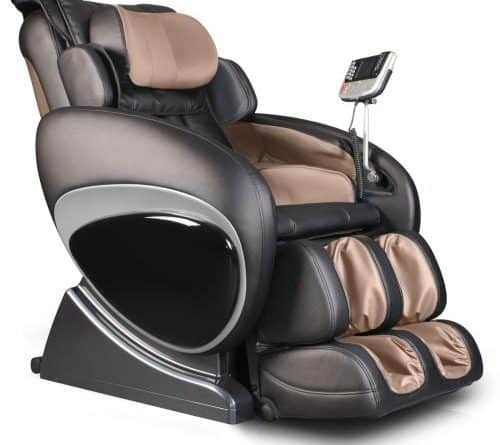 If you are looking for a mid-range full body massage chair the Osaki should be on your list. If you have specific needs such as a sports injury or back injury you can tailor your massage specifically for that. It is also a good choice as a general massage chair for fun and relaxation. The contemporary design would enhance any living space and also be a talking point! Although a massage chair can never replace the human touch and expertise of a qualified masseuse this chair is value for money and buyers have reported how cost effective it is and there are many positive feedback reviews of the Osaki. Who is Osaki NOT for? Can I use the Osaki os-4000 if I am pregnant? There are mixed opinions on this question. If you are in any doubt you should consult your midwife or a health professional. Most manufacturers advise against using a massage chair when pregnant and this is especially true in the first trimester. However, there can be many beneficial effects of a gentle massage and the relaxation whilst pregnant. See our in-depth article on Using a Massage Chair During Pregnancy. Advantages of the Osaki os-4000 over Leading Competitors? See our massage chair reviews for detailed information and comparison with other chairs. Briefly, the Osaki os-4000 compares favourably with other chairs of similar price due to its manufacture and usability. Is the Osaki os-4000 value for money? Is the Osaki easy to use? Is the Osaki available online? Is the Osaki delivered fully assembled? Is the Osaki fun to use? Is the Osaki good for back pain? Is the Osaki good for a full body human touch massage? Obviously buying a massage chair is a significant investment and each purchaser has his or her own likes and dislikes. Here is a brief overview of some of the reported pros and cons of the Osaki. • If you remove the back pillow you can get a good neck massage. • The heat in the chair is very effective. • The chair is comfortable and the zero gravity feature is one of the most popular features of the chair. • The massage on the foot, calf hip and shoulder is very good. • The back massage is very good. • Programming the different types of massage is easy to do. • The massage is not as firm as other massage chairs. • If you are not tall, say less than 5’5″ the back pillow cannot be removed which can make the chair less comfortable. • The chair is not assembled on delivery. You need 2 people and a few hours to assemble. • The heat can take at least 5 minutes before you feel it. • There is a 30min time limit. The chair cannot be used more than 60 consecutive minutes without a cool-down period. • The calf massage can be too strong for some. Conclusion: is the Osaki os-4000 worth your money? The Osaki os-4000 isn’t one of the most expensive massage chairs available on the market, but it does punch above its weight in a number of areas. It is a more affordable option for many and gives a good full body human touch massage. 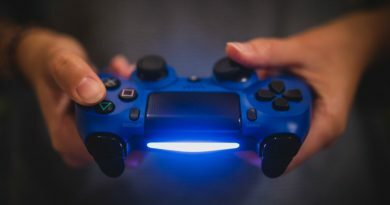 Obviously, if you have more cash to spend on this type of product there are massage chairs available with much more technology and durability. 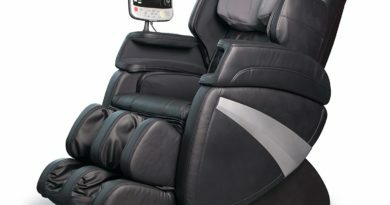 We at whichmassagechair.com think you will be happy with the value for money of the Osaki 0s-4000 but if you want to compare other chairs on the market check out our other reviews.